Note: Yesterday I had this whole post about New Year’s resolutions written and ready to go but thought that, well, it was boring. So I scrapped it and started on this one. Hope you enjoy it! The world of media consumption is changing. Rapidly. I know I’m not the first person to say that. However I might be the first to say this: Everything you need to know about the evolution and trends of media consumption can seen from watching makeup bloggers on YouTube. Yep, YouTube makeup bloggers. I watch them. Maybe you should too. Let me explain. This all started maybe a year ago when my wife was looking up some makeup tutorials for a few new looks she wanted to try out. I was hanging out on the couch next to her, probably scanning through Twitter, when I realized that these ladies were killing it on YouTube. They have thousands of subscribers. Each video has several hundred thousand views with hundreds of comments. I’m humbled I have a video with over 5,000 views. Is this really a thing? Then I started paying attention. Hmm… Jump cuts, some basic titling and an engaging personality with 10 seconds of bloopers tacked on at the end. That was the formula a year ago and it worked. There was a slow shift I noticed over the past year. The space started to get crowded. Lots of new YouTubers doing makeup reviews and tutorials were popping up. What happened next? The ones who are successful today began to ramp up their video production. They went from jump cuts to jump cuts mixed with some out-of-the-box transitions to jump cuts mixed with some actual decent transitions. The titling became more structured. Then it became artistic with some 3D moves, stylistic placement and custom fonts. They still keep their engaging personalities and bloopers. In fact, they actually went more in depth into their lives. There were more on-location shoots. There started adding in more artistic introductions that in no way could they have shot themselves. What does this have to do with me as a video professional? I had been out of school and working as an editor for about a year. My girlfriend, now wife, and I were looking to relocate. I had some connections in that city that got me a couple meetings with industry people there. So I went down there and it was clear after the three meetings… these people were terrified that the barriers of entry into the video world were so low that all these “kids in basements” were going to steal their jobs and put them out of business. I had/have no compassion for them. That’s for another post though. But they were correct about one thing… the barriers of entry into the video world are low. This is a good thing in my opinion. Competition breeds better results. How? Look at the makeup bloggers on YouTube. Whether you are a “kid in a basement,” a top-notch post production facility or someone in between, there’s a place for all of us. The new makeup bloggers will find their niche and ramp up production quality. Otherwise they’ll fade out. Wherever you are in your video career, will you find your niche and ramp up production? Or will you fade out? The makeup bloggers on YouTube mix a variety of video genres. First and foremost they entertain (as all our videos should in some way). Then they teach which taps into the educational market, which is what I’m mostly interested in. Lastly they incorporate elements of vlogging and reality TV. They take the stylistically simple and successful elements of each genre and use them. We know the lines are blurring between what is shown on the big screen in our living room and the tiny screen in our pockets (and now the tiny screen in our pockets being played back on the big screen in our living room). Pieces are moving and the industry is shifting. We need to pay attention to what is happening off of the broadcast networks and movie screens. I believe you can see these trends with makeup bloggers on YouTube. I’m going to end this post with two questions and two simple requests. Questions: Where do you go to look at industry trends? In what niches do you see microcosms of the video industry? Leave your answers in the comments! Requests: If you enjoyed this post and want to receive new posts in your inbox, please punch in your email address in the box at the top-right or bottom of the page. You’ll just get an email each time there is a new post which is typically every Wednesday for posts like this and every Friday for new tutorials. This’ll help me better know who is reading my site and I can create better content specifically for you. 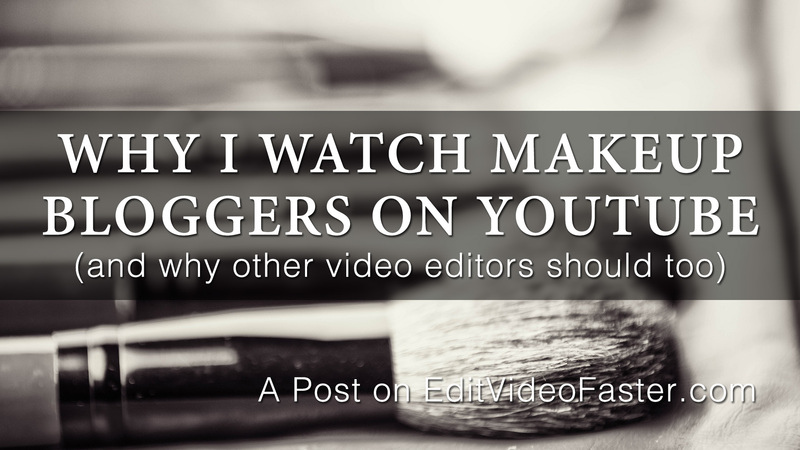 Second, if you know a fellow video editor who could benefit from this post, send it to them. Thanks as always for reading. I’ll see you on Friday with a new tutorial! Now I’m off to go watch Vertigo on the big screen! !